I’ve been reading about La Revolution Francaise recently and it seems that there are some really useful lessons we can learn from what happened. The revolution happened because huge military spending had left France bankrupt. This, combined with poor harvests, led to starvation. Over-spending by governments is a recipe for disaster. US government debt currently stands at $16.4 trillion. Hmm, did we learn anything there? The problem could have been fixed by fair taxation, but wasn’t. The nobility and clergy were exempt from taxes, even though they owned most of the wealth, so it wasn’t too surprising that the country was bankrupt. These days, the wealthy pay most of the tax, so the situation is reversed. The people saw that the Queen had diamonds while they were starving. They believed that the Queen’s diamonds were the cause of the problem. Selling off the Queen’s jewellery would have made no difference to the country’s finances, and France was still bankrupt after Marie Antoinette had been executed. Wealth inequality wasn’t the problem then and still isn’t. The revolution began with violence and death. Once that started, there was no way to stop it. It isn’t surprising that suspending the rule of law and beginning a campaign of mass execution ends badly. Up to 100,000 people were executed, mostly for no valid reason. All revolutions go the same way, and history teaches us that once the killing starts it can’t be stopped. Yet modern would-be revolutionaries ignore this most important lesson. To try to lower the price of bread, the revolutionaries imposed price controls. They arrested and executed anyone who sold bread at a price higher than the law allowed. And not surprisingly bread became even scarcer than before. Who would make and sell bread when there was no money to be made, just the risk of being executed as a profiteer? The people starved. Lesson learned? No, just watch modern politicians imposing price controls on everything from electricity to food. Anyone who criticized the Revolution was arrested and executed. Including the instigators of the Revolution itself. Once you’ve created a monster, don’t be surprised if it eats you. Freedom of speech was considered counter-revolutionary. Criticizing the Revolution was treason. Robespierre, one of the leaders of the Revolution, decreed that anyone who showed fear when accused of treason must be guilty. He probably showed fear himself when he was guillotined without trial a few years later. Lesson learned? That freedom of speech and fair trials are of paramount importance? Probably. 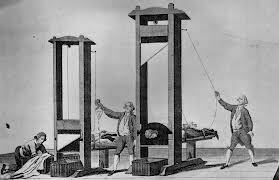 I think that even Robespierre probably worked that one out. Anyone for a revolution? Two centuries later, of the six obvious lessons, only two seem to have been learned. This entry was posted in Politics and tagged Belief, Democracy, Economics, Equality, Free trade, Freedom, Human rights, Money, Politics, Poverty, Tax, Wealth. Bookmark the permalink. I didn’t think of the points so logically as you’ve presented them although I think I may disagree with one or two of your thoughts. I saw that touched you on the US of A. In America’s case I think that there a few issues going on in the country that I find fascinating and go back to the country’s founders and not directly comparable to the French Revolution. I like this logical perspective and I think you’re probably right. From your post I’ve taken away some truly thought-provoking … hmm, worries? Yes, worries. I do worry about our slowness as a society to learn. Sometimes I think we are just a few small steps away from total social and economic collapse. Funny that you say that, Steve … because I often feel precisely the same way. It’s frightening. I like your presentation. violence begets violence. No war is without its atrocities. At the same time, those atrocities cannot morally be justified. As Revolutions go, the French and American Revolutions were happening simultaneously, yet they both took different paths to accomplish their vision. Where America fought mostly on the battle field, and the citizenry was largely divided, There were no arrests due to disagreements, though many loyalists lost their possessions and fled. Even the American Revolutionaries disagreed with one another and even fought amongst themselves. The French, on the other hand, only thought it to be one way-all or nothing-and nothing was going to stop them from having it that way. And many of the leaders of the French Revolution became enamored with the idea of becoming emperor themselves which crippled their ability to see clearly and often caused them to murder innocent people for no reason. I’m not a pacifist, but violence does indeed beget violence much of the time. Usually, other solutions are to be preferred. Democracy is a mess, but it saves us from the worst atrocities. Good starting points for discussion. #1 seems to have skipped steps. Starvation on the streets is certainly a cause of revolution, and the U.S. debt is a problem, but I’m not sure that our current handling of the debt is inevitably leading to starvation and revolution. (Our deficits have been going down lately as the economy has improved, which means we’re at least managing debt growth.) #2 I disagree. That upper tax rates in the U.S. have plummeted since the 1980s and yet the rich still pay most of the taxes merely shows how enormously well the rich are doing compared to the middle and working classes. It’s not clear to me that this isn’t one potential stimulant of revolution. # 3 See # 2. # 4 As a rule, I’m with you that revolutions are a slippery slope to uncontrolled violence. I don’t think this means they are never justified, but it definitely should give us pause. # 5 I’m for some kind of balance between market-driven pricing (normal conditions) and controls (in exceptional conditions) to prevent monopolies and gouging, and, in the case of great wealth inequality, to prevent even necessities being priced out of range of workers. I lack your complete faith in the goodness of the market. # 6 Although I probably fail your “learned my lesson” test, I’m with you on this one. The progressive ideals that were liberating in the 1960s and 70s have become the guillotine of newer “identity politics” liberals, who now devour their own as they enforce speech and thought restrictions, who compete to see who can tear down the most monuments and artworks generated under the social conditions of previous centuries (e.g., currently in my hometown of New Orleans), and who are demanding guilty verdicts before the trial in recent police cases (which is not to say that the cops are all innocent, but I feel out of step with my liberal brethren when I say that individuals deserve trials and not just preconceived verdicts). Thanks for opening a debate, Gary. 1. Debt and starvation. It’s not likely that current levels of debt in the US will lead to starvation. But in Greece it led to mass unemployment and civil unrest, which was only avoided by Germany stepping in with billions of Euros in loans. US debt is around 90% of GDP. In Greece it was about twice that. I don’t have any figures for pre-revolutionary France. But France would probably have been OK if it hadn’t been for several severe winters damaging crops. A country (or individual, or corporation) with high debts is very vulnerable to the unexpected. 2. Tax. I don’t know what you’re disagreeing about. We agree that the wealthy should pay most of the tax, and we agree that in modern times they do. 3. Wealth inequality. This may be a trigger for social unrest, but so are religion, race, gender, educational differences and even different sporting allegiances. That doesn’t make it acceptable. You mention that wealth inequality leads to even necessities being priced out of range of workers, but I think you are confusing inequality with poverty. 4. Violence begets violence. I agree that this is an over-simplification. My article was a short one. Sometimes I argue in favour of military action. 5. Monopolies are a specific issue. When monopolies exist the market ceases to operate. Any market needs strong and clear rules for it to operate fairly and efficiently. 6. Yes, even since I wrote this article two years ago, the tide has turned in subtle ways against free speech. And what’s most disturbing is that this isn’t coming from reactionaries, but from so-called liberals. I find this VERY disturbing indeed. Hey Steve. Either I’m short of time to continue the debate or one of us is getting smarter, but I think I agree with all 6 of your reply points! Great minds synchronize over time!